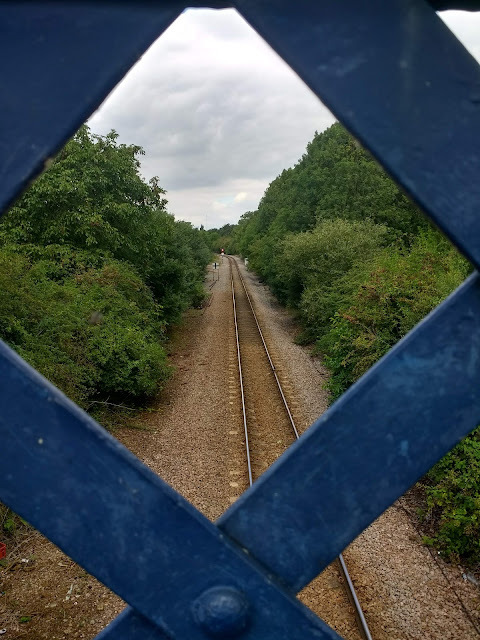 I went for a wander in the direction of Coldhams Lane Bridge, considering drifting into the small industrial estate next to the railway line, behind what used to be the Greyhound Pub. On route along Cromwell Road, outside the small parade of shops, I noticed Yin/Yang symbol in the pavement. 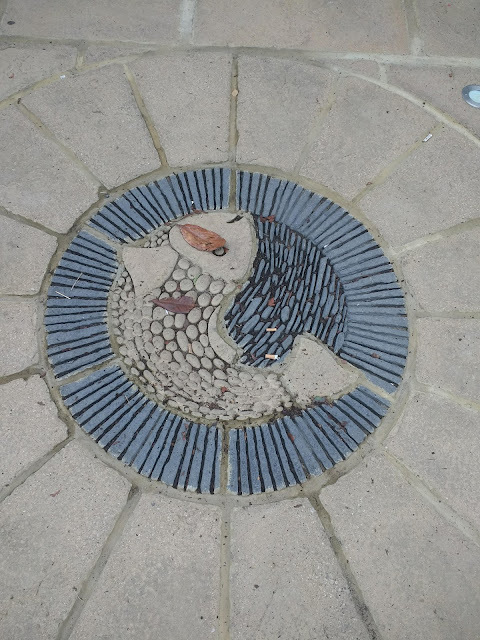 On closer inspection it was a fish curving around the sea. The fish had a brown leaf covering it's eye, though Autumn was not due for a few weeks yet. At this point I changed my mind and decided to go to Coldham's Common. 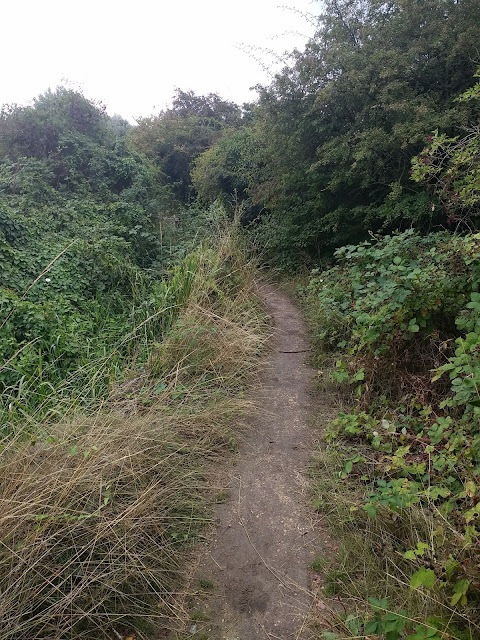 Maybe I'd be able to access the Industrial Estate from the other end, through a secluded path through the woods. I arrived at the Coldhams Lane entrance to the Common, not far from the bottom of the bridge and Industrial Estate. Cattle were grazing each side of the footpath I took across the expanse of rough grass, as they often are, in close proximity to light industry and MOT garages that were hidden from view the other side of some trees. 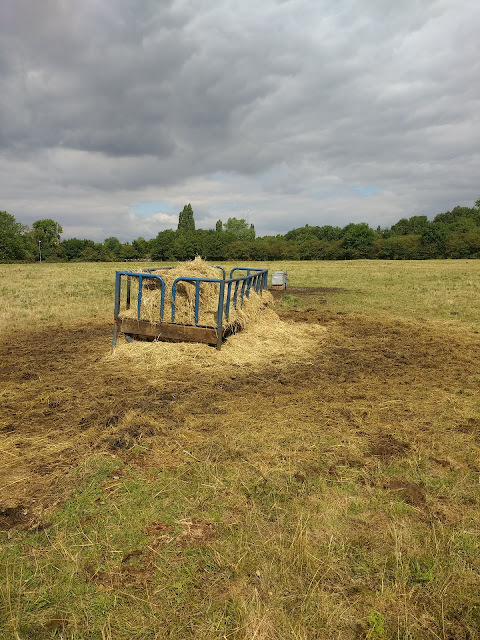 I read that The Common avoided enclosure in 1594 when someobody called Jake The Style led locals in revolt against an attempted land grab, and so we can thank him that the space is still there for the use of the common people. The linked website is the only reference to Jake The Style that I can find. Whether he really exited or was made up for educational purposes I'm not sure. Just beyond the grazing cattle, I went under the railway line, through the low black underpass. Often a magnet for both graffiti and cowshit, less so today. 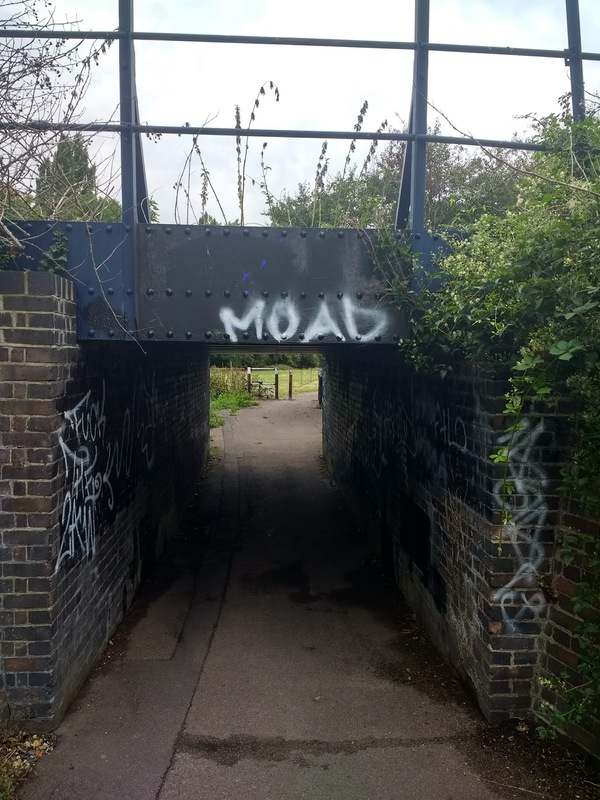 The legend 'MOAD' sprayed over the entrance. 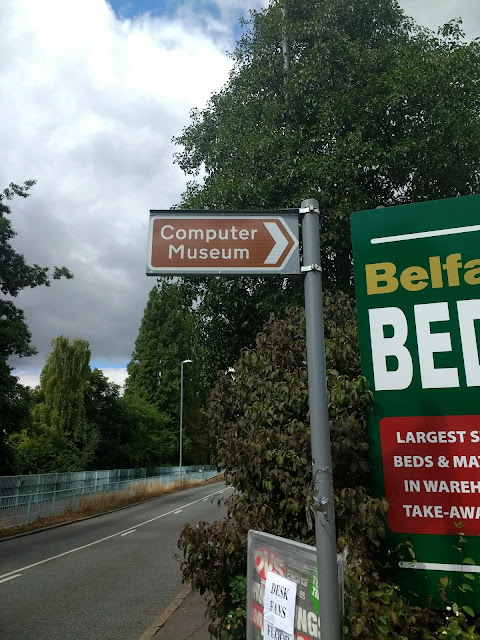 An unlikely location for either the Museum of African Diasphora or the Mother of All Databases. Maybe here the acronym had a different meaning, marking the lair of something or someone malignant. Unknown to the Greater Anglia passengers passing over the bridge in their ingorance of the underneath, as they move along the track that bifurcates the common and stretches off in the direction of Ipswich. It was around here I think, that in my pre school years, I was sped across the green on a bike by my mum, while we were chased by a horse. She was petrified of the beast and glad to get the other side of the bridge. I can't remember a thing about it but my imagined version of the scene came into my head. I don't think they put horses here these days. Probably for the best. Through the other side and into another area of The Common. The border of trees to the left continued to bar the way into the industrial estate with the assistance of a pointy grey metal fence. I gave up on the idea that a backway might exist and was soon distracted by a series of two raised concrete yellow painted manhole covers with accompanying posts. Almost fluorescent against the grey sky, presumably marking the drifting of liquid, sludge or sewage under the surface of The Common. I crossed the bridge over Coldham's Brook. Beyond this is another area of The Common, which leads up to Newmarket Road. On the right another grey pointy fence, this time marking the boundary of The Abbey Stadium, where Cambridge United play football. On match days the away supporters are herded into the area reserved for them. 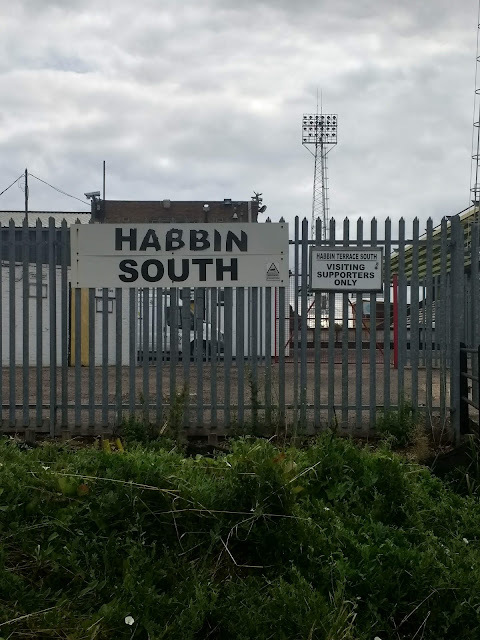 Habbin South sounds like one of the Glasgow street gangs shown on the map in James Patrick's book 'A Glasgow Gang Observered'. But the stand is named after Harry Habbin, who was an enthusiastic supporter of the U's and not as far as I know had no Scottish street gang connections. Unlike Harry, I've never been much of a football enthusiast. When my Dad took me along when I was small, normally to a midweek evening match, I went grudgingly. 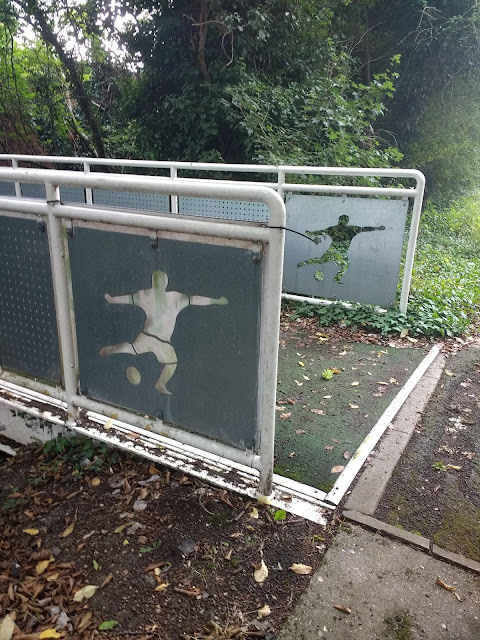 Time seemed to expand within the realms of the football ground. An hour and a half seemed like an eternity. It was usually dark, often raining. Half time offered the highlight for me, some chips or a pie. I had a brief spell of liking football when I was about nine years old, and for some reason became a supporter of Ipswich Town. I sometimes went to see them with a friend and his dad, on the train passing through the Common unaware of the lair of MOAB as the passengers are today. Ipswich were a division above Cambridge. 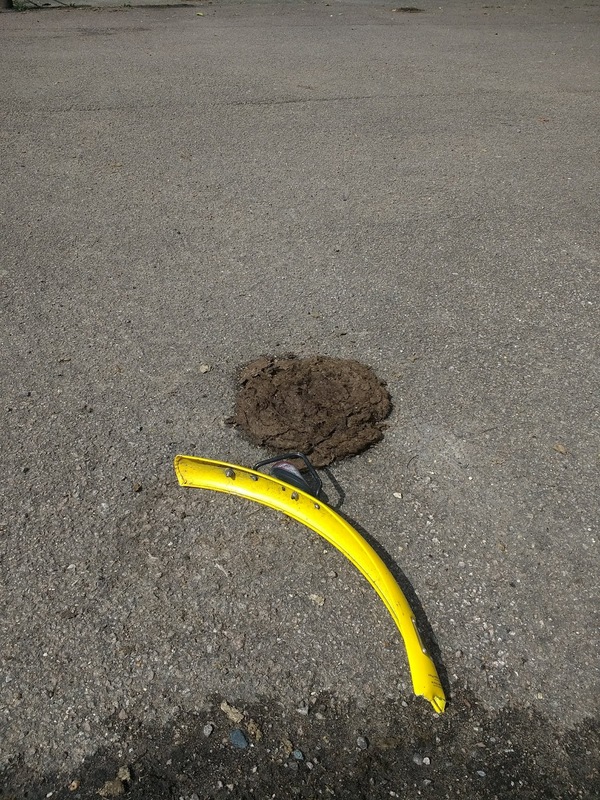 So when the two teams clashed in the prestigious Willhire Cup, an East Anglian football tournament sponsored by a local van hire company, I went with my Dad to the Abbey to watch the U's get mercilessly thrashed. My pleasure was short lived as Tom Finney scored the only goal in the match, winning it for Cambridge. This marked the end of my short lived support for Ipswich and football in general. My Dad continued to go 'up the football', often on Saturday afternoons when he used to bunk off work. He would meet up with fellow local Co-op managers who had slipped out for a couple of hours. One bloke was clocked on the TV at a match by his boss. A bright red jumper and big cigar not helping him to blend into the crowd. It must have been around this time that football hooliganism was rife. Cambridge was not immune to this. The leader of the local 'firm', The Cambridge Casuals', was known as the General and infamously orchestrated the violent ambush of some Chelsea fans on the way to a match. This resulted in tabloid panic and prison sentences for the General and his cronies. Not so long ago I read that they, along with other 'veteren' football hooligans, were back at it, in their 60s. Like aging rock stars trying to re-live their heydey. Maybe they are hoping to get put back inside to avoid the financial worries of retirement. 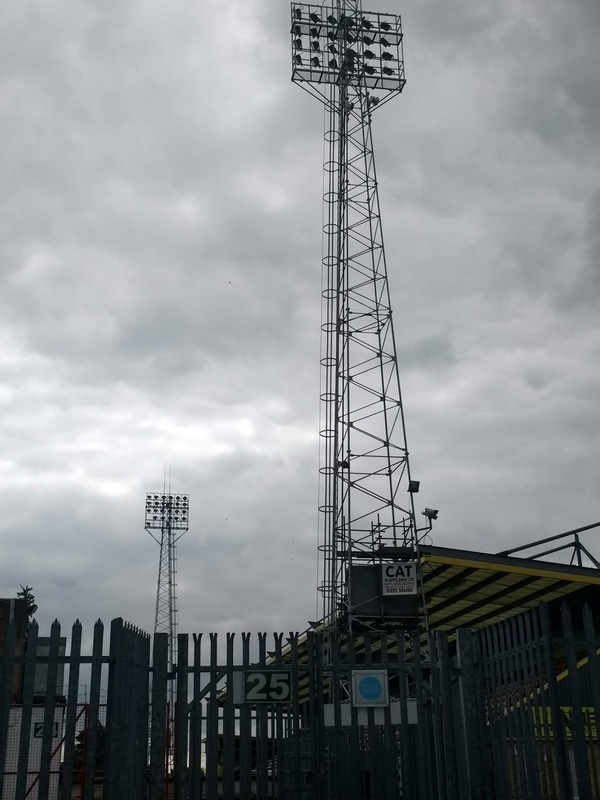 These thoughts drifted through my head while I stood gazing at the the pylon-like structures of the floodlights, sinister against the grey clouds. It being a Tuesday morning the football ground was devoid of any sign of human life and eerily silent. It resembled an industrial estate, electricity sub-station or prison camp more that a place of frenetic sporting activity. The liminal atmosphere here was not just down to the lack of people, grey skies and industrial like structures of the football ground. The semi-edgeland location of The Common is another factor. Physically, it's not right out on the edge of the city. But it's far enough out of the centre to feel beyond the grip of the University and to make it outside the scope for most tourists. 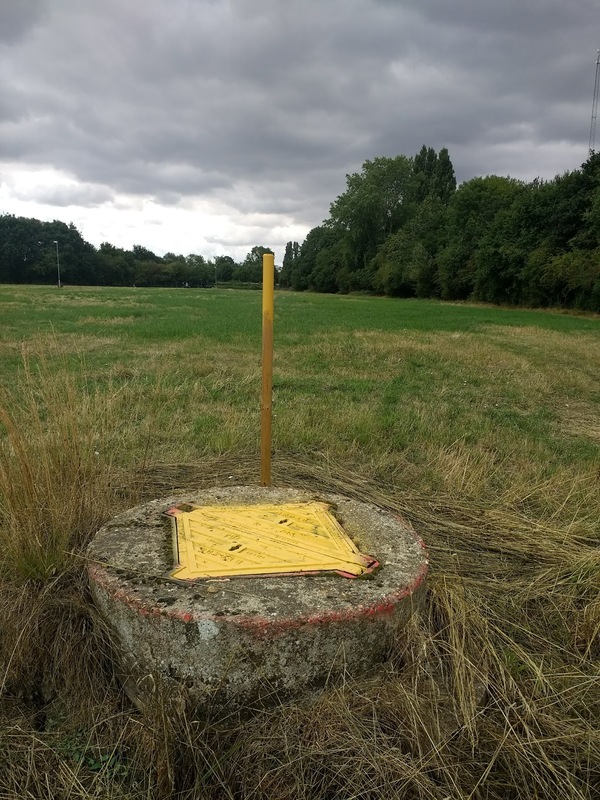 Being surrounded by light industry, retail parks, a postwar (ex) council estate, a couple of main roads and the airport, it is buffered to an extent from casual penetration. The University Golf Club did appropriate part the Common as a golf course in the late 1800s. This was fairly short lived, and it was described as the world's worst golf course. The rough ground, stinking ditches and presence of hooligans made it less than ideal. As did the proximity of a rifle range at the far side of The Common. These days there is football (including the American and Gaelic varieties) and the inevitable park run. There is no apparent University presence, sporting or otherwise. I wandered back across the brook and turned left to follow it down the narrow path hugging it's course. For a short while I could have been anywhere in the middle of nowhere. Brambles, no people, not a lot of sound. 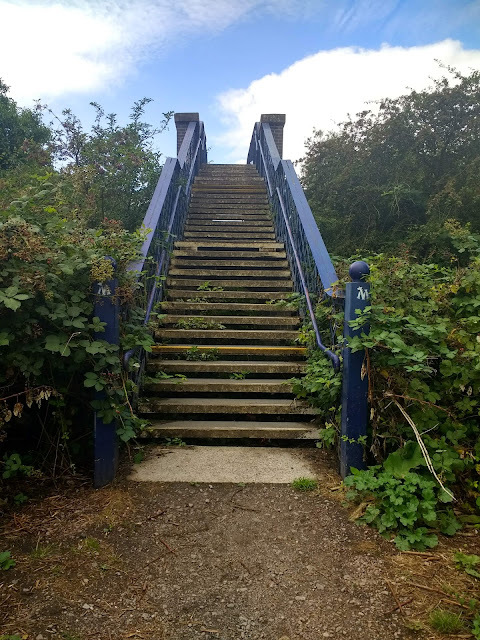 The illusion was lifted as I arrived at a footbridge leading to a children's playground and the entrance to the swimming pool. The bridge was decorated by the ubiquitous Cambridge Heron. Another bridge a bit further along featured more artwork. This time more official and featuring opposite footballers. The one with the green background looked like a thin Hulk or maybe a Green Lantern. The white one a Silver Surfer. 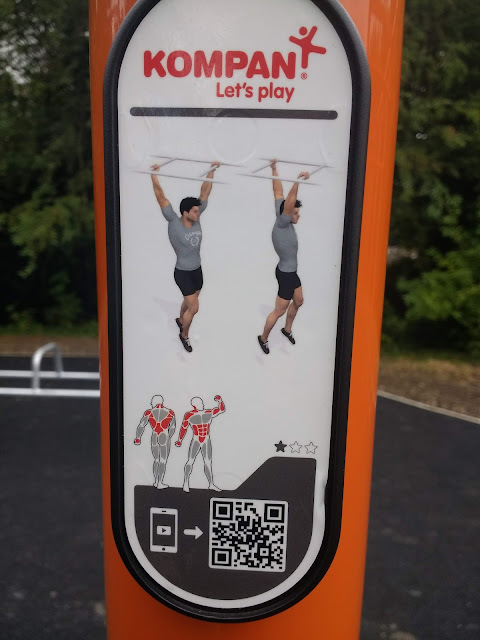 More superhero-esque characters appeared at the outdoor gym. One raising both blank face and fist at the men dangling from the climbing frame and awarding a one star rating. The other wandering off in the opposite direction, less than impressed. 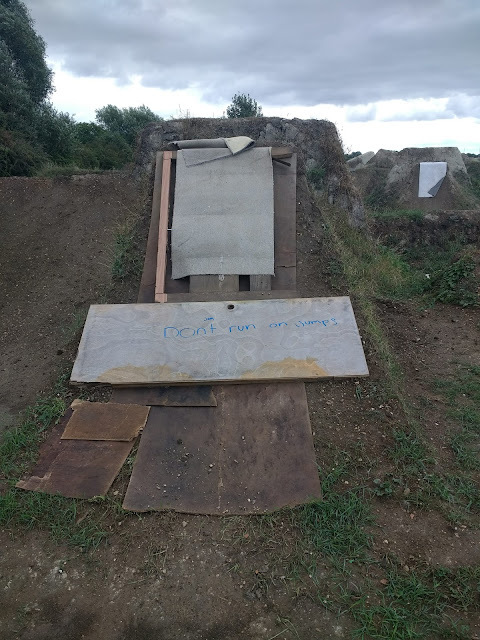 A short wander from here I came to the entrance to the BMX park, signified by a defaced council notice. I wandered into it and followed the course for a bit. Like the gym, it was deserted. It felt like it had been for years, abandoned with bits of board left to shore up the impossibly steep slopes, as if to preserve them from weathering in an off season lull which had extended from the 80s, when BMXing was something that had it's own programme on Channel 4. I knew though that the track dated from a more recent time, a later BMX revival. In the 80s, an earlier track known as 'Sandy Banks' existed in another part of town, across the river. It had, according to local legend at the time, been built unofficially by the kids who used it. This explained the entrance being fenced off suddenly one day, barring access to the site. The closure seemed to follow somebody throwing something at a rower from the track resulting in an argument. The fence was swiftly bashed down to regain access. But blocked again and later the area was developed. I don't know where the name Sandy Banks came from. It was on the river bank but not very sandy. 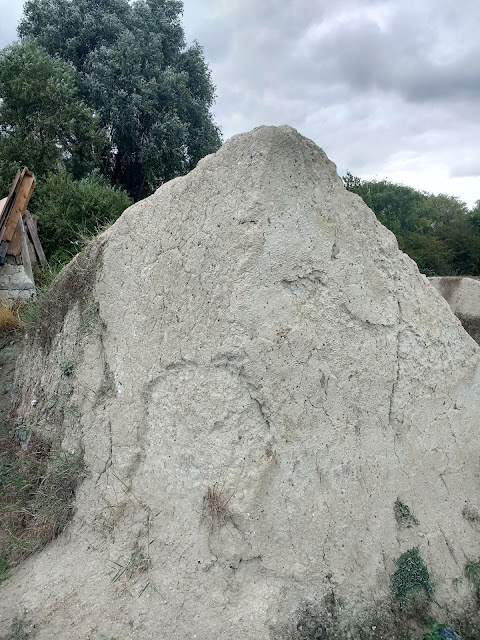 The Coldhams Common track looked like soil of some indeterminate type had been deposited to create it but despite the protective boards, has drifted away in places, the chalk underneath exposed like teeth with the enamel scraped off. 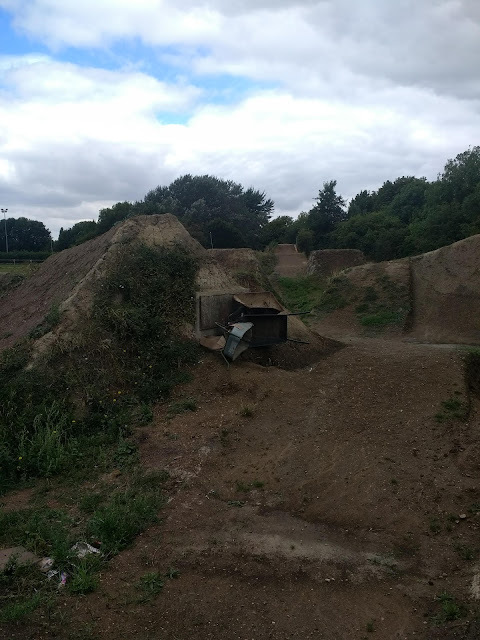 The track resembled a minature disused quarry, or alien planet from a low budget British sci-fi TV programme. A pile of detritus appeared to have been flytipped in front of what looked like a sealed metal horizontal door. An entrance to tunnels or caves under the ramps perhaps. Home of a 'stig of the dump' type character or several of them. Or a Moonbase Alpha. The door offering protection from gangs of ruffians and whatever dwelt in the lair of MOAB. I left the minature world of the apparently abandoned BMX track and wandered across the field which contained a couple of sports pitches. 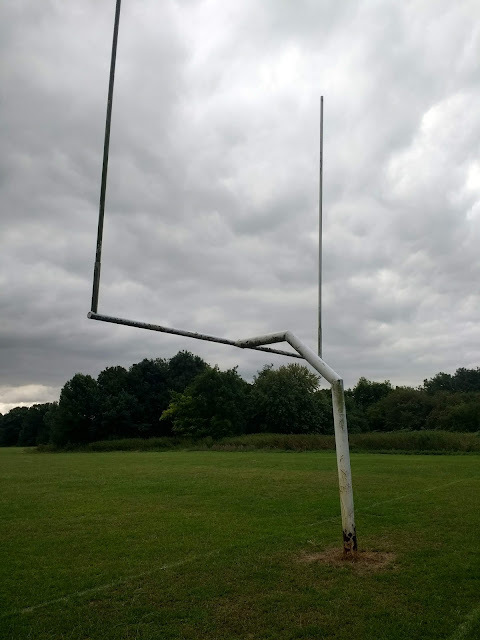 The American football and rugby posts resembled dead anntena, no longer broadcasting or receiving. No low level hum to be heard. I still saw nobody, as I crossed the field. The lack of people not ominous, on the contrary having such a large open area to myself felt almost cheeky. The peaceful physical space seemed to create a parallel space in my head, one with plenty of room, decluttered from the everyday. The other side of the field I reached the bridge crossing the railway. The mark of 'M' freshly daubed each side of the stairway. I've seen this moniker before but much less often than the 'Nigel' tag, which was conspicuous by its absence in The Common. 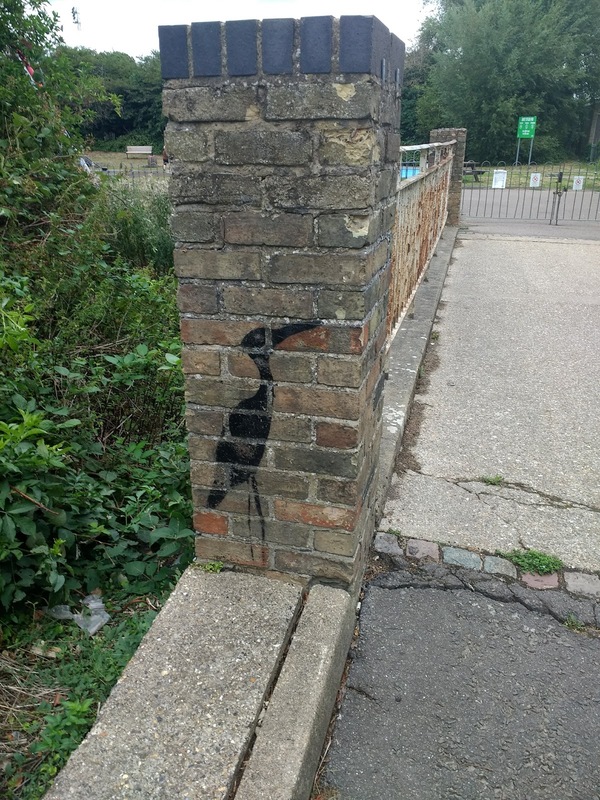 'M' a more discerning graffiti artist maybe. The bridge had been freshly painted blue. Normally a spot for graffiti artists, it is a sort of focal point. In my mind's eye it was always painted black and was a mysterious object, something that at one stage I wasn't sure actually existed apart from in a dream I'd had. This is no doubt due to the lack of frequency of visits to The Common over the years mixed with vague childhood memories dredged up from my subconscious. When I approached the bridge, it still had the air of something distant in my memory or imagining, just out of reach of my grasp. A physical manifestation of a time and place I can't be sure really happened. From the top of the bridge I looked through one of the metal diamond shaped spaces of the railing in the direction of Ipswich. Attached to the bridge was a leftover notice from 'Cambridge'Live' about the imminent use of The Common as an overspill campsite for the Cambridge Folk Festival, which takes place at Cherry Hinton Hall a mile or so away. This was now a few weeks ago and the notice hung upside down. The Folk Festival has been running since the 60s and at least these days is what you might call a respectable mainstream festival. Until recently it was sponsored by Radio 2 and has glamping as well as the widespread use of fold-up chairs by the audience. In 1969 and 1970, there was apparently a different festival actually on The Common. The Cambridge Free Festival, according to the UK rock festivals website, was a real thing. The line up looks too good to be true. King Crimson, Terry Reid, David Bowie, Edgar Broughton, Incredible String Band and a plethora of other bands regarded as legendary these days as well as ones faded into obscurity. Henry Cow were based at the University so more believable. The organisers appear to have been involved with people from the Cambridge Arts Lab, which may explain the presence of David Bowie. It also seems the same people were involved in starting the still going Strawberry Fair on Midsummer Common ( a place more central and compact than Coldhams), and that the Coldhams Common festivals were a sort of precursor to the Fair. That said, elsewhere the internet is silent on the events, and some of the accounts on the UK Rock Festival site may be less than reliable. No doubt memories of the time are somewhat hazy. On the railway another reminder of the past. I haven't seen a milk crate for years. The Unigate and Coop dairies used to compete for business along with a couple of also-rans. They came in the morning, in parallel to the Ice Cream vans which arrived the other end if if the day. Mr Whippy and Mr Rosso in similar competition, heated arguments in Italian with lots of hand gestures if they showed up at the same time. 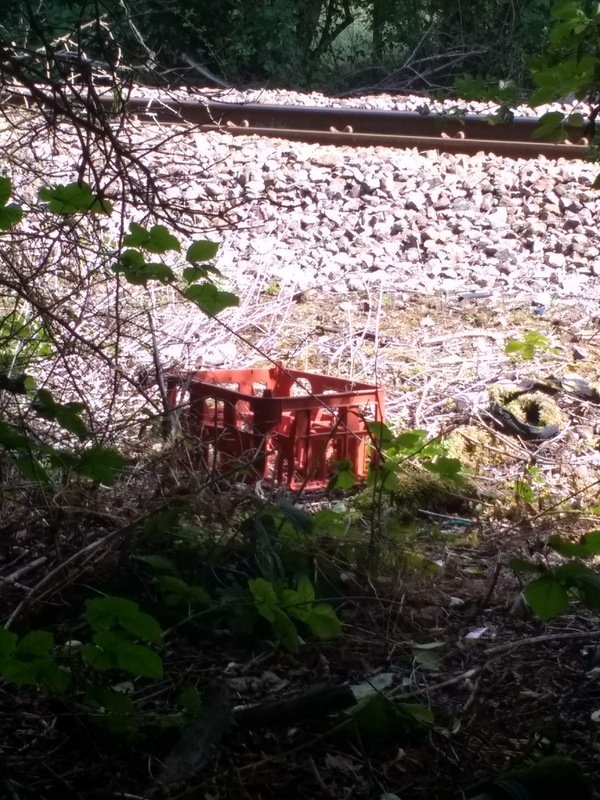 The red milk crate I associated with Unigate, who had better shaped bottles. Another ghost from the recent-ish past. Back into the field I'd started at, the emergency cattle feed had been put out early due to the hot spell. The sight briefly made the area seem remotely rural when looking away from the road ahead. The meeting of urban and rural was concisely symbolised by a discarded Ofo Bike mudguard next to a cowpat, just before the exit into Coldhams Lane. I exited The Common leaving behind a world of vague memories and liminal imaginings. 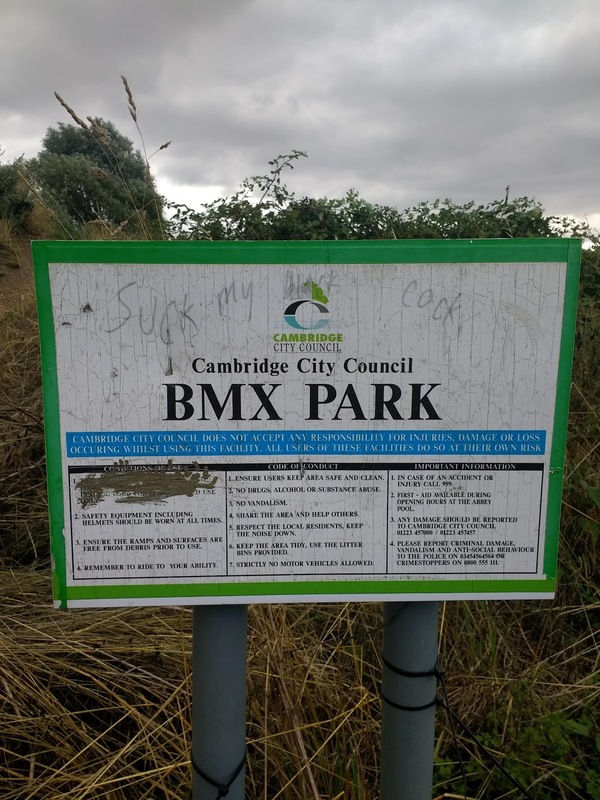 I wondered why I had visited so infrequently what is probably Cambridge's best green space within the City boundaries. Immediately on exit I was almost diverted into the industrial estate and into another recent past by the brown sign pointing to the Computer Museum. I had no idea it was there. I decided to save a visit for another day, and wandered off with a vision of old Sinclair and BBC computers in exhibition cases displaying Horace Goes Skiing and Football Manager on loop, while at the same time the noise of a tape recorder loading games across the room provided a sound equivelent of a low level but persistent migraine. The seemingly endless hot spell still dominating, I wandered along Trinity Street on route to the Market. Opposite St John's College was the seemingly permenant crowd of Chinese tourists taking pictures of the building, their families or themselves. 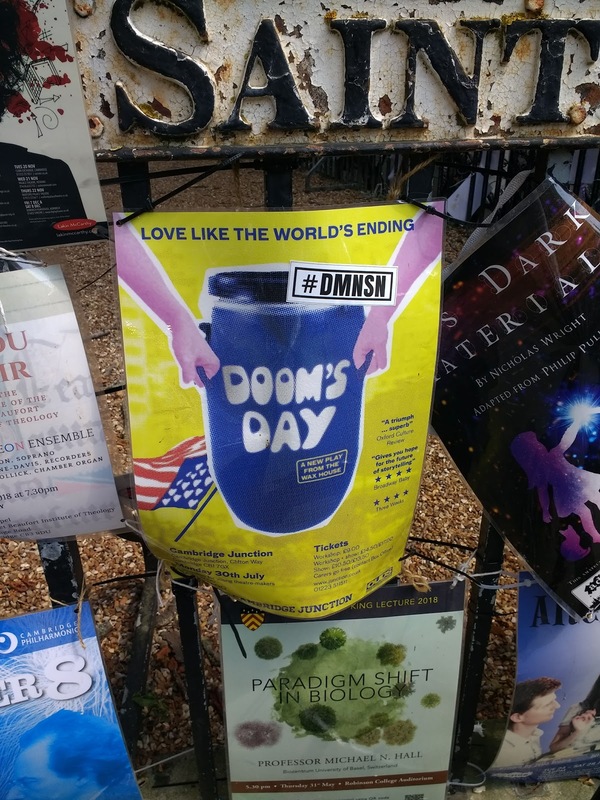 The railings of All Saints Garden were, as usual, festooned with a profusion of laminated posters advertising various cultural events, mostly connected to the University. caught my eye. 'Love like the world's ending' the strapline. Underneath another lamenated notice talked of a 'paradigm shift in biology'. Meanwhile, in the news much talk of food shortages and stockpiling along with plastic pollution killing marine wildlife and leading to environmental disaster. 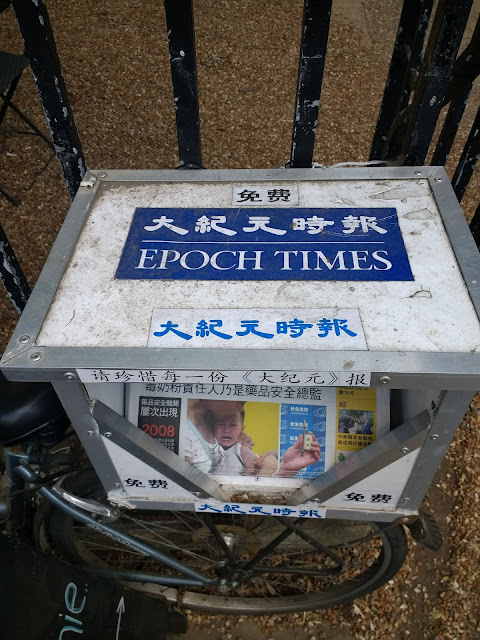 A little further along a box attached to the railings dispensed the end if the world sounding 'The Epoch Times'. A mother with a scared looking child on the front page, next to a picture of a hand holding what looked like some sort of dice. The Epoch Times is the newspaper of the Chinese Falun Gong religion. Branded a dangerous cult by the Chinese Authorities, it's adherents are described as victims of human rights abuses by the Chinese Government in the West. 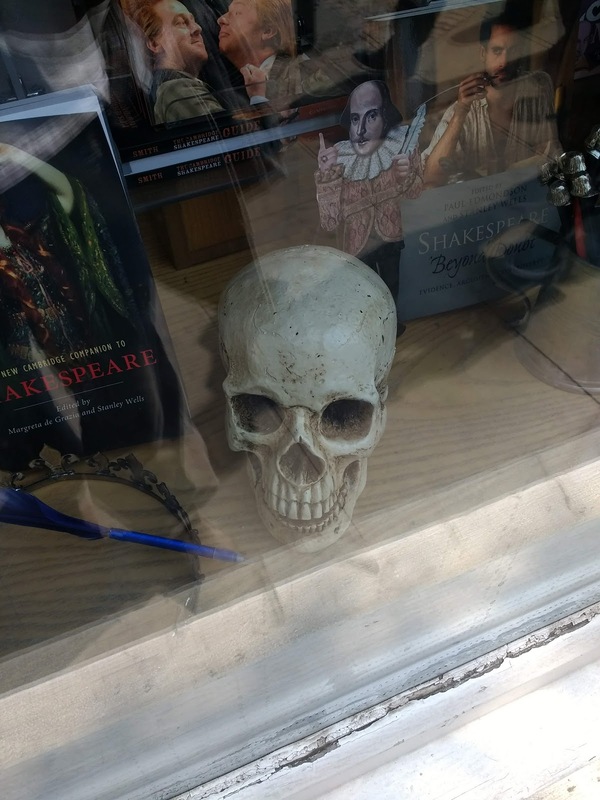 The other end of the street, in the window of the University bookshop a mocking skull stared out. Part of a Shakespeare display, but equally part of the apocalyptic cavalcade I had been presented with along the street. A narrative powered by the unrelenting and abnormal weather brought by the heatwave. On the way back I took a detour around All Saints Garden. Along one side yet another laminted notice offered a series of talks on 'Wellbeing'. A current buzzword, which appears to have emerged with difficult times. In order to achieve 'wellbeing', if only temporarily, various strategies and mental tools are employed. Yoga, meditation or mindfulness are often promoted. I favour going for a walk, it normally helps. But on this one real and imagined horrors had been brought to the fore. I appeared to have been drawn into a world of the end of the world. The searing desert-like heat. The recent encounter with the low budget Mad Max like figure of the Viker Biker and subsequent viewing of 'No Blades of Grass'. Watching the return to pre-industrial Britain dystopia in the 70s children's TV series 'The Changes'. All these things had preceded this walk. The poster reminded me that, if the end of the world was nigh, it was largely beyond my control. No point worrying about it. Try to enjoy and appreciate the now. Writing this a couple of weeks after the event, the heat has subsided and with it sort of equilibrium had been restored, for the moment at least. 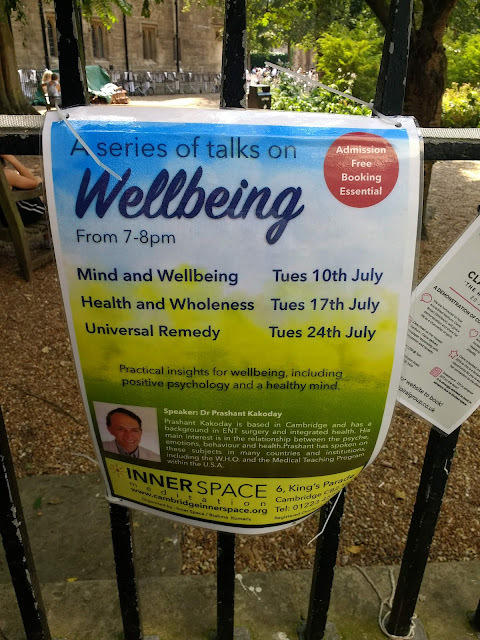 I didn't need to go to the wellbeing talks. If instead, it had said 'walks' I might have been tempted.